The 2017 UEFA Champions League Final was the final match of the 2016–17 UEFA Champions League, the 62nd season of Europe's premier club football tournament organised by UEFA, and the 25th season since it was renamed from the European Champion Clubs' Cup to the UEFA Champions League. 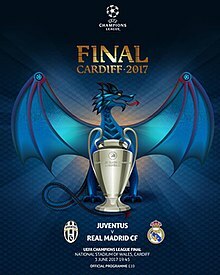 It was played at the Millennium Stadium in Cardiff, Wales on 3 June 2017, between Italian side Juventus and Spanish side and title holders Real Madrid, in a repeat of the 1998 final. Real Madrid won the match 4–1 to secure their 12th title in this competition. With this victory, as the defending champions, Real Madrid became the first ever team to successfully defend their title in the Champions League era, and the first to do so since Milan in 1990. On the other hand, Juventus lost a fifth final in a row and a seventh in nine finals reached. Real Madrid qualified as the UEFA representative at the 2017 FIFA Club World Cup in the United Arab Emirates, and also earned the right to play against the winners of the 2016–17 UEFA Europa League, Manchester United, in the 2017 UEFA Super Cup. In the following table, finals until 1992 were in the European Cup era, since 1993 were in the UEFA Champions League era. 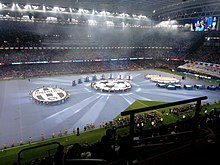 The Millennium Stadium was announced as the final venue on 30 June 2015, following the decision of the UEFA Executive Committee meeting in Prague, Czech Republic. The stadium entered into a naming rights deal with the Principality Building Society in 2016 that saw it renamed as the "Principality Stadium"; however, due to UEFA regulations regarding the use of names of non-tournament sponsors, they continue to use the name "Millennium Stadium" in official literature, while the name "National Stadium of Wales" was used for the final itself. The match was a repeat of the 1998 final, making it the eighth repeated final pairing. Real Madrid won the 1998 final 1–0. The 2017 final was the first time since the two teams met in 1998 that both finalists had won either their domestic league or the Champions League the previous season. Juventus reached their ninth final after a 4–1 aggregate win against Monaco to maintain their undefeated record in this season's competition. Juventus also entered the final with the best defensive record in the 2016–17 Champions League, having conceded only three times. Previously Juventus won finals in 1985 and 1996, and lost a record six in 1973, 1983, 1997, 1998, 2003 and 2015. This was also their 14th final in all seasonal UEFA competitions, having also played in one Cup Winners' Cup final (winning in 1984) and four UEFA Cup finals (winning in 1977, 1990 and 1993, and losing in 1995). If they were to lose, Juventus would tie Benfica's record of five consecutive finals lost. Title holders Real Madrid reached a record 15th final after a 4–2 aggregate win against city rivals Atlético Madrid, knocking them out of the competition for the fourth consecutive season. Real Madrid went into the final as top scorers of the 2016–17 Champions League, having scored 32 goals. This final is their third since 2014, and gives Real a chance to win a record 12th title. Previously they won finals in 1956, 1957, 1958, 1959, 1960, 1966, 1998, 2000, 2002, 2014 and 2016, and lost in 1962, 1964 and 1981. This was also their 19th final in all seasonal UEFA competitions, having also played in two Cup Winners' Cup finals (losing in 1971 and 1983) and two UEFA Cup finals (winning in 1985 and 1986). Real Madrid are looking to be the first team in the Champions League era (since 1993) to win two consecutive finals. Four times prior the previous champions have advanced to the final (Milan in 1995, Ajax in 1996, Juventus in 1997, and Manchester United in 2009), but on all occasions the title holders lost. The two sides had previously met eighteen times in European competitions, all in the European Cup/UEFA Champions League, with a record of eight wins each and two draws. The first meeting between the two sides took place in the 1961–62 European Cup quarter-finals, where Real Madrid beat Juventus 3–1 in a play-off after the two sides exchanged 1–0 away wins. The most recent meeting between the clubs had taken place in the 2014–15 UEFA Champions League semi-finals, where Juventus won 3–2 on aggregate to advance to the 2015 final. Juventus entered the final chasing their first treble of domestic league, domestic cup, and Champions League titles, bidding to become the ninth team to win it. They won the 2016–17 Coppa Italia after defeating Lazio in the final on 17 May, and clinched the 2016–17 Serie A title on 21 May. Real Madrid were chasing the double of domestic league and Champions League titles, having won the 2016–17 La Liga on 21 May, the final day of the season. The ambassador for the final was former Wales international Ian Rush, who won the European Cup with Liverpool in 1984, and also played for Juventus from 1987 to 1988. UEFA unveiled the brand identity of the final on 25 August 2016 in Monaco during the group stage draw. With a stadium capacity of 66,000 for the final, a total amount of 41,500 tickets were available to fans and the general public, with the two finalist teams receiving 18,000 tickets each and with 5,500 tickets being available for sale to fans worldwide via UEFA.com from 17 to 28 March 2017 in four price categories: £390, £275, £140, and £60. The remaining tickets were allocated to the local organising committee, UEFA and national associations, commercial partners and broadcasters, and to serve the corporate hospitality programme. American hip-hop group The Black Eyed Peas performed at the opening ceremony preceding the final. The performance, which included a pyrotechnic display, ran over time and forced the kick-off to be delayed by several minutes. The 2017 UEFA Women's Champions League Final was held two days prior, on 1 June 2017, at the Cardiff City Stadium, with title holders Lyon beating Paris Saint-Germain 7–6 on penalties, following a 0–0 draw after extra time. The winning penalty was scored by Lyon goalkeeper Sarah Bouhaddi, immediately after her opposite number, Katarzyna Kiedrzynek, had missed her kick. The annual UEFA Champions Festival was held between 1–4 June 2017 at Cardiff Bay. German referee Felix Brych was announced as the final referee by UEFA on 12 May 2017. Cristiano Ronaldo, who scored twice, was named Man of the Match. Juventus dominated possession in the opening 19 minutes of the match, and had three major chances to score. Gonzalo Higuaín had two shots on goal that were easily saved by Keylor Navas, while Miralem Pjanić had a more dangerous chance that Navas dived to push wide to his right. Despite the scoring chances, as well as the closing down of Real Madrid's counterattacks in the midfield, Cristiano Ronaldo scored the first goal of the match in the 20th minute; Dani Carvajal played a one-two on the right with Ronaldo before passing across for him to shoot low to the left corner of the net, which deflected in off the right foot of Leonardo Bonucci. Juventus responded with a goal seven minutes later to bring the score to 1–1. Mario Mandžukić chested down a ball from Higuaín and hooked the ball over his shoulder from 15 yards (14 m), which arced over Navas. The goal was heralded as one of the best goals ever scored in a Champions League final and was compared to Zinedine Zidane's goal in the 2002 final for Real Madrid. Juventus remained in control through the end of the first half, while Real Madrid conceded two yellow cards for defenders Sergio Ramos and Dani Carvajal. Real Madrid began the second half strongly and in control, though play was stopped several times for fouls and injuries to both sides. Real Madrid took a 2–1 lead in the 61st minute from a long-range strike from Casemiro, which deflected off Sami Khedira and past Gianluigi Buffon to the left corner of the net. Three minutes later, Ronaldo scored Madrid's third goal of the night and his second, finishing in the 6-yard (5.5 m) box from a cut-back from Luka Modrić on the right. Juventus, fending off additional attacks from Madrid, picked up three additional yellow cards, including one to newly substituted Juan Cuadrado. Real Madrid replaced striker Karim Benzema with Gareth Bale, a Cardiff native who had not been fit enough to start but was given a homecoming. Cuadrado picked up a second yellow card and was sent off in the 84th minute for a shove on Sergio Ramos, who went down while holding his foot. Marco Asensio scored Madrid's fourth and final goal in the 90th minute, a tap-in from 12 yards (11 m) after a cut-back from Marcelo from the left. The "home" team (for administrative purposes) was determined by an additional draw held after the semi-final draw, which was held on 21 April 2017 at UEFA headquarters in Nyon, Switzerland. With their win, Real Madrid secured a record-extending twelfth title in the European Cup/Champions League and became the first club to win back-to-back titles in the Champions League era. This was the club's third title win in four seasons; a feat that has only occurred thrice before – Real Madrid (1956–60), Ajax (1971–73) and Bayern Munich (1974–76). Real Madrid has not lost a final in the Champions League era, with their last defeat occurring in 1981. The victory also saw Madrid secure their first League – European Cup double since the 1957–58 season. Madrid's first goal in the final marked their 500th all-time goal in the competition, becoming the first club to reach the milestone. Cristiano Ronaldo also became the first player to score in three Champions League finals, and ranking second with the European Cup included, only behind Alfredo Di Stéfano's five finals scored in. Twenty-one year old Asensio became the youngest Real Madrid player to score in a European Cup/Champions League final. With their loss, Juventus extended their record number of final losses to seven, and tied Benfica's record of five consecutive finals lost. At the post-match press conference, Allegri stated that Juventus had played well in the first-half but failed to make the most of their chances. He felt that his team "let go psychologically" after conceding the second goal. Allegri added, "Even if Real Madrid had a very good second half and have excellent players who can change the game at any moment, that second goal knocked the wind out of our sails. They raised the tempo, as we were the ones pushing Real Madrid back in the first half, but in the second we couldn't play our way out of defence and they kept pushing us back. At that moment, we should've taken out the extra energy to push hard and keep the game open, as we know Real Madrid leave you the chances to score at all times, but we conceded the third goal and that was really damaging." Juventus captain Buffon stated that losing the match was a big disappointment. He felt his side had "an excellent first half, where we caused Real Madrid huge problems" but "in the second half their class, strength and how accustomed they are to winning these games showed through. They won deservedly." If Juventus had won, Buffon would have become the oldest player to win a Champions League surpassing compatriot Paolo Maldini. FIFA President Gianni Infantino, who attended the match, told reporters, "Juventus played a great first half, then in the second Real Madrid were extraordinary. They were two excellent sides and in the end the best team won." Zidane declared that his players deserved to win the double and become the first team to defend the title in the Champions league era. Zidane stated, "They have made history, for sure. Nobody has done it, and now we have. Today is a historic day for all Madridistas, for the players, for me, for all our family. But saying this, you know how it is. Next year will be much more difficult. We will have to work a lot to try and win again. But today we can say we are a very good team, and we deserved to win La Liga and the Champions League. It was not easy." He also felt that "a lot of hard work" was the reason behind the team's success. Zidane also revealed that he had instructed his players to "keep going, but to play a bit higher up the pitch, and to keep the ball" during the half-time team talk. Ramos said he was proud that Madrid had "kept their date with history" and felt it was because of the harmonious relationship among the players. Madrid's captain said, "We are tremendously proud of this team, and this institution. We had a date with history and were really looking forward to it. For 59 years we had not achieved the double, and nobody had ever won two Champions Leagues in a row. We were able to keep a dressing room without any jealousies and that was key. Success does not come by coincidence. We are a great group, headed by a great coach in Zidane. Three Champions Leagues in four years is crazy." Kroos revealed that he did not believe that Madrid would be able to successfully defend the trophy saying, "I didn't expect it would be possible to defend this title as it's so difficult to win it once. But to do it twice in a row is unbelievable. To win it three times in the last four years means a lot. It means it's not only a good team on the pitch but off the pitch. It's like that and I'm happy to be part of the team." Kroos also pointed out that Juventus had only conceded three goals in their entire Champions League campaign, and that scoring four against them in the final was a sign of Madrid's quality. Modrić said that Madrid's performance in the first half was because they had "dropped back too much". He felt that the team's performance improved in the second half after Zidane instructed them to become "more aggressive" and "to not allow Juve to keep the ball easily". Cardiff native Bale stated that winning the title in his hometown was a "great feeling". He also stated that he had no regrets about not being able to start the match, and was happy to have been able to play. During a viewing event for the match in Turin, one woman died, and at least 1,500 people were injured. ^ a b "Majestic Real Madrid win Champions League in Cardiff". UEFA.com. Union of European Football Associations. 3 June 2017. Retrieved 3 June 2017. ^ a b c d e f "Felix Brych appointed Champions League final referee". UEFA.com. Union of European Football Associations. 12 May 2017. Retrieved 13 May 2017. ^ a b "Full Time Report Final – Juventus v Real Madrid" (PDF). UEFA.com. Union of European Football Associations. 3 June 2017. Retrieved 3 June 2017. ^ a b c "Tactical Line-ups – Final – Saturday 3 June 2017" (PDF). UEFA.com. Union of European Football Associations. 3 June 2017. Retrieved 3 June 2017. ^ a b "Cardiff to host 2017 Champions League final". UEFA.com. Union of European Football Associations. 30 June 2015. Retrieved 13 May 2017. ^ "2016/17 Champions League: all you need to know". UEFA.com. Union of European Football Associations. Retrieved 5 June 2016. ^ "One Year Countdown to 2017 Champions League Final". faw.cymru. Football Association of Wales. 3 June 2016. Retrieved 5 June 2016. ^ Abbandonato, Paul (3 June 2016). "The Principality Stadium will have to change its name for the Champions League final next year". WalesOnline. Media Wales. Retrieved 5 June 2016. ^ "Second time round: European Cup final rematches". UEFA.com. 16 May 2017. ^ "Juventus and Real Madrid's previous final appearances". UEFA.com. Union of European Football Associations. 10 May 2017. ^ "2017 UEFA Champions League Final Press Kit" (PDF). UEFA.com. Union of European Football Associations. May 2017. Retrieved 3 June 2017. ^ Murray, Scott (10 May 2017). "Atlético Madrid 2-1 Real Madrid (agg 2-4): Champions League semi-final – as it happened". The Guardian. Retrieved 10 May 2017. ^ "Will Madrid end Champions League holders' curse?". UEFA.com. Union of European Football Associations. 10 May 2017. Retrieved 13 May 2017. ^ "Juventus v Real Madrid: past meetings". UEFA.com. Union of European Football Associations. 11 May 2017. Retrieved 13 May 2017. ^ "Can Juventus become ninth team to complete treble?". UEFA.com. 31 May 2017. ^ "Juventus win Coppa Italia, Madrid on brink of Liga title". UEFA.com. 17 May 2017. ^ "Juventus first to win six Serie A titles in a row". UEFA.com. 21 May 2017. ^ "Real Madrid end five-year wait for Liga title". UEFA.com. 21 May 2017. ^ "Ian Rush named ambassador for Cardiff final". UEFA.com. Union of European Football Associations. 23 August 2016. Retrieved 13 May 2017. ^ "Cardiff 2017 final identity launched". UEFA.com. Union of European Football Associations. 25 August 2016. Retrieved 13 May 2017. ^ "2017 UEFA Champions League final ticket sales launched". UEFA.com. Union of European Football Associations. 17 March 2017. ^ Gibson, Sean (3 June 2017). "Fans not happy as Champions League final kick-off delayed after 'awful' Black Eyed Peas performance". The Telegraph. Retrieved 3 June 2017. ^ "UEFA CHAMPIONS FESTIVAL". faw.cymru. Football Association of Wales. Retrieved 13 May 2017. ^ a b c d e Das, Andrew; Smith, Rory (3 June 2017). "Real Madrid Beats Juventus for 2nd Straight Champions League Title". The New York Times. Retrieved 3 June 2017. ^ a b c d "Real Madrid and Cristiano Ronaldo see off Juventus to win Champions League". The Guardian. 3 June 2017. Retrieved 3 June 2017. ^ Joseph, Adi (3 June 2017). "Juventus' Mario Mandzukic nets one of the craziest goals in Champions League history". USA Today. Retrieved 3 June 2017. ^ "Is Mario Mandzukic's goal the best ever in a Champions League final?". The Independent. 3 June 2017. Retrieved 3 June 2017. ^ a b c d e Glendenning, Barry (3 June 2017). "Juventus 1-4 Real Madrid: Champions League final 2017 – live!". The Guardian. Retrieved 3 June 2017. ^ "UEFA Champions League semi-final draw". UEFA.com. Union of European Football Associations. Retrieved 3 June 2017. ^ "Regulations of the UEFA Champions League 2016/17 Season" (PDF). UEFA.com. Union of European Football Associations. Retrieved 29 June 2016. ^ a b c "Team statistics" (PDF). UEFA.com. Union of European Football Associations. 3 June 2017. Retrieved 3 June 2017. ^ "Real Madrid become first team to win back-to-back Champions League finals". Goal.com. 3 June 2017. Retrieved 3 June 2017. ^ a b "Five Aside: The stats that define Real Madrid's UCL win over Juventus". ESPNFC.com. Retrieved 10 June 2017. ^ "Real Madrid reach reach 500-goal milestone". UEFA. 3 June 2017. Retrieved 3 June 2017. ^ "Cristiano Ronaldo makes history by scoring in third final". UEFA. 3 June 2017. Retrieved 3 June 2017. ^ "Juventus 'let go psychologically' in Champions League final - Max Allegri". ESPNFC.com. Retrieved 10 June 2017. ^ "Juventus goalkeeper Gianluigi Buffon: It all went wrong for us vs. Real". ESPNFC.com. Retrieved 10 June 2017. ^ "Zinedine Zidane hails historic Real Madrid win, vows to stay at Bernabeu". ESPNFC.com. Retrieved 10 June 2017. ^ "Gareth Bale: Real Madrid's Champions League triumph an 'incredible scene'". ESPNFC.com. Retrieved 10 June 2017. ^ "Luka Modric: This Real Madrid side can win more Champions Leagues". ESPNFC.com. Retrieved 10 June 2017. ^ "Champions League Final: Winning at home is a dream come true, says Gareth Bale". The Indian Express. 4 June 2017. Retrieved 10 June 2017. ^ La Stampa, ed. (15 June 2017). "Morta la donna travolta in piazza San Carlo" (in Italian). Retrieved 15 June 2017. ^ "200 injured in Juventus fan panic after bomb scare: police". Yahoo Sports. Agence France-Presse. 3 June 2017. Retrieved 3 June 2017.